I recently had a conversation with my daughter about firearms. What’s so interesting about that you may ask? My daughter is 3 years old. I carry a firearm every day, dry fire and practice my draw nearly daily, instruct firearms classes and evaluate firearms and gear. I have never hidden my work or ‘tools of the trade’ from my daughter, so she has seen firearms, holsters etc. nearly every day. In the past she has pointed to my gun and asked, “What is that?” and said, “Is that your gun?” She is my first and only child, and at first, I was uncertain about exactly when and how I should respond. I spoke to my wife and we kicked around a few ideas. Some recommendations were to hide the firearms and never let her see them ever. Another was to just say, “It is not a toy,” if she asks, and leave it at that. I wasn't crazy about these techniques, as they were much different from how I taught her about other hazards in the house. So, my wife and I decided to stick with the same technique that had been working with everything else. For example, when my daughter became interested in the electrical outlet and sticking things into it, I sat down and explained to her that it is very dangerous and can hurt her. The same way you teach a child not to touch the hot stove, I believe you can teach your child not to touch a firearm. Toy guns are fine, but when should the discussion about what to do with a real gun begin? Each time my daughter does something potentially dangerous, I see it as a teachable moment. In the past, I had responded to her questions about my gun, by saying, “It is my gun for work,” “It is not a toy, and is only for adults,” or “This is something you never touch.” But as I was cleaning my firearms the other day, my daughter came over to me and asked, “Are you cleaning your guns daddy?” Instead of just telling her yes and not to touch them, I decided that at 3 and a half I was going to seize the moment to have a more serious talk. I thought that it was better to curb some of the increased inquisitiveness she was showing – you know, take some of the glamor and awe away. The gun was already disassembled so I showed it to her. I told her it was very dangerous and asked her, “Are you allowed to touch this?” She said that she was not allowed to touch it and that it was only for adults. She retained all those warnings and instructions I had given her each time she had asked about my firearm. This time was a little different though. I allowed her to get close to the disassembled firearm and saw that she was hesitant to go near it. She poked at it with her finger, and then said: “That’s just for you daddy.” I praised her and she walked off for a moment, returning to the table where I had my firearm disassembled. She looked at the firearm, and was pretty uninterested, asking only if we could play once I was finished. While my wife and I are religious about gun safety and locking up our firearms, I couldn't help but feel a little happier knowing that my daughter was at least picking up early on the idea that firearms are to be handled with care and are not a toy (something that sadly some adults still can’t grasp). I feel that her inquisitiveness level was decreased and that would not have happened had I merely hid the gun from her or never allowed her to safely get close to it. Kids can learn how to be safe around guns. Some may say that at 3 years old, my daughter should not have even seen a firearm, and others probably believe I waited too long. Every situation may be different based on the maturity of the child and the child’s interest in the firearm. However, I felt it was the appropriate time to instruct her not to touch it, just as I had instructed her to not touch the hot stove when she showed interest in doing that. Our talk lasted only about 5 minutes, but I feel it laid the foundation of instilling safety and understanding with her about firearms. Is this the end of the conversation about firearms with my daughter? Absolutely not. Every gun owner should be EVER VIGILANT in enforcing firearms safety to their children. Not only in teaching with words but by demonstrating and truly making gun safety as routine and as automatic as putting on a seatbelt in the car. This is only the first step in an ongoing culture of firearms awareness and safe handling that I’m hoping to instill in her as she grows. The next step will be to test her. My wife and I talked about laying a disassembled firearm on the coffee table, walking away to somewhere she can’t see us and asking her to get something from the table. We are hoping that she shows the same disinterest in the firearm then, but if she doesn’t that will be another teachable moment in a controlled environment. I don’t know – maybe the next step after that might be to lay out an unloaded assembled firearm in a controlled environment and see what she does. I think that we will constantly be trying to think of more and more creative ways to teach her firearm safety and to reinforce good habits. As far as the range, and teaching her to shoot, I will address that when and if she shows interest, at a much older age and maturity level, of course. But for now, the seeds of firearms safety have been planted, and I don’t feel that it was too soon to reap rewards. I think that we are the ultimate protectors of our children. We should give them the tools and knowledge to remain safe. We owe it to them to never take firearm safety lightly because often times, our actions speak louder than our words. Is this the end of the conversation about firearms with my daughter? Absolutely not. Every gun owner should be EVER VIGILANT in enforcing firearms safety to their children. Not only in teaching with words but by demonstrating and truly making gun safety as routine and as automatic as putting on a seatbelt in the car. This is only the first step in an ongoing culture of firearms awareness and safe handling that I’m hoping to instill in her as she grows. The next step will be to test her. My wife and I talked about laying a disassembled firearm on the coffee table, walking away to somewhere she can’t see us and asking her to get something from the table. We are hoping that she shows the same disinterest in the firearm then, but if she doesn’t that will be another teachable moment in a controlled environment. I don’t know – maybe the next step after that might be to lay out an unloaded assembled firearm in a controlled environment and see what she does. I think that we will constantly be trying to think of more and more creative ways to teach her firearm safety and to reinforce good habits. As far as the range, and teaching her to shoot, I will address that when and if she shows interest, at a much older age and maturity level, of course. But for now, the seeds of firearms safety have been planted, and I don’t feel that it was too soon to reap rewards. I think that we are the ultimate protectors of our children. We should give them the tools and knowledge to remain safe. We owe it to them to never take firearm safety lightly because often times, our actions speak louder than our words. I know we will constantly be trying to think of more and more creative ways to teach her firearm safety and to reinforce good habits. As far as the range, and teaching her to shoot, I will address that when and if she shows interest, at a much older age and maturity level, of course. But for now, the seeds of firearms safety have been planted, and I don’t feel that it was too soon to reap rewards. I think that we are the ultimate protectors of our children. We should give them the tools and knowledge to remain safe. We owe it to them to never take firearm safety lightly because often times, our actions speak louder than our words. Teaching our children how to be safe around firearms is something every firearm owning parent should do. But remember we set the example, and have to do our part of being safe. This includes what we do with the firearm when it is not on our person. Ever wonder what people do with their firearm when it's not attached to their body? The results from a poll of Concealed Carry Inc readers may surprise you! I agree with your handling of the curiosity, about firearms, from your daughter. The very first time children show interest in guns, is the right time, to begin educating them. Answers need to be age-appropriate for each child. Hi Ron, Thanks for the feedback! The article has some repetitions, e.g. 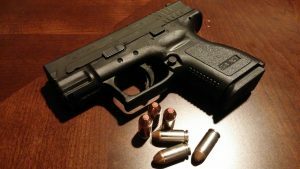 “But for now, the seeds of firearms safety…”. It needs proofreading. Thanks for catching that Rafal.